then restore our faith in new beginnings. hidden, waiting its time to burst free. rampant and rustling under our skins. Neile Graham's life is full of writing and writers. She is a graduate of Clarion West Writers Workshop and currently serves as their workshop director. The workshop was the inspiration for this poem. Her poetry and fiction have been published in the U.S, the U.K., and Canada. She has three full-length poetry collections, most recently Blood Memory, and a spoken word CD, She Says: Poems Selected and New. New poems have appeared this year in Interfictions, Liminality, and Through the Gate. 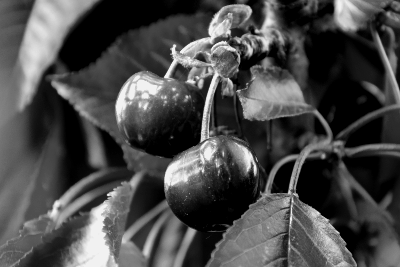 Photography: adapted from Two cherries, by 0x010C.